With a declared major of marine biology I was assigned an academic advisor who studied both freshwater and marine crustaceans. Research on the latter was conducted in Antarctica. I had to meet with her once a term to review coursework progress. 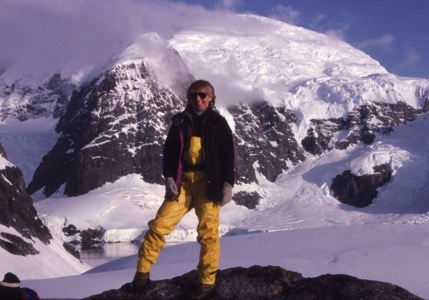 Each meeting she shared enthralling stories about the remarkable organisms of Antarctica and their various adaptations to the frigid south polar waters. 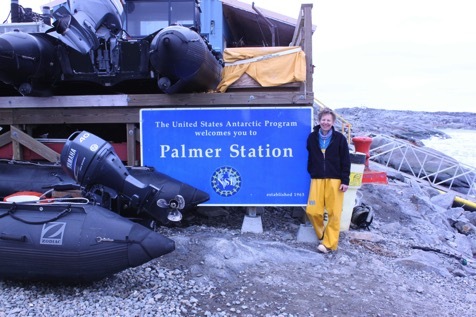 My junior year I volunteered in her laboratory on campus and during my senior year was asked to be a participant in her field work in Antarctica after I graduated. Claire: How did this interest develop into a lifelong passion? Simply by being lucky enough to continue stumbling into opportunities that allowed me to return to Antarctica. Broadly, I have had the privilege of working on four different projects over the years. My undergraduate experience, studying visual and reproductive biology of krill lead to graduate and post-graduate work on additional aspects of krill physiology. Basically every experiment was aimed at understanding what makes a two-inch long shrimp-like crustacean so vastly abundant in Antarctica’s waters. 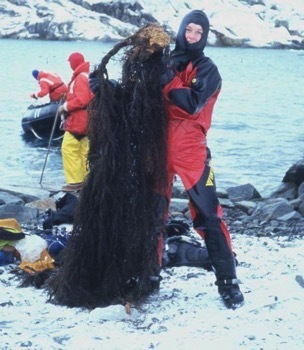 A different Antarctic research project, out of the University of Alabama at Birmingham, has had me for many years now studying the chemical ecology of shallow-water benthic organisms. 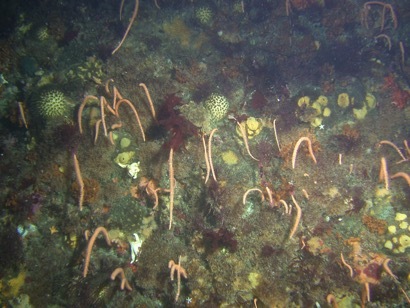 Simply, this research attempts to understand how organisms, which are attached to the bottom (i.e. benthic) and cannot run away from predator protect themselves, survive. A surprising number of sponges, tunicates (sea squirts), macroalgae (like kelp)—all attached, benthic organisms—keep mobile organisms from eating them by producing special chemicals that make them taste bad thus deterring or repelling would be diners. Such chemicals play a pivotal role in community interactions, hence the discipline chemical ecology. Another project, also based out of UAB, studied the effects of ocean acidification on shallow-water benthic communities of Antarctica. As the world’s atmosphere warms and carbon dioxide levels rise, the world ocean is also warming and absorbing more carbon dioxide. More carbon dioxide in the water disrupts the balance of seawater chemistry and effectively makes the seawater more acid. More acidic water stresses marine organisms and especially those living in polar waters. Organisms that have calcium in an external skeleton – snails, clams, sea urchins – are particularly vulnerable to ocean acidification as their skeletons can literally dissolve. This is akin to using vinegar or even soda pop (both mildly acidic) to dissolve lime deposits (calcium) around a kitchen faucet. Each and every organism in a community plays a role in maintaining the dynamics or ecology of the community so who knows what would happen if oceans became too acidic to support snails, urchins, etc. Finally, the fourth area of Antarctic research I have had the pleasure of pursuing is exploring its deep sea through photographic surveys of the seafloor. Long, long ago Antarctic waters hosted sharks and other strong jawed biting fish and also crabs with claws to crush open the shells of snails, clams, even urchins. 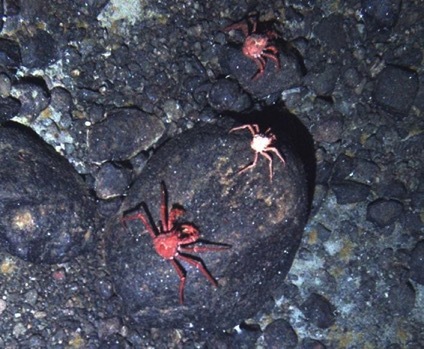 Anecdotal evidence suggested crabs were living in the deepest dark depths of Antarctica. Three imaging cruises since 2010 have generated several hundred thousand images of life on the bottom – including crabs. Quite an exciting find but quite worrisome too. As the shallow waters of Antarctica warm due to climate change it is possible that crabs could extend their range from the depths into shallower waters if water temperatures remain high enough to not freeze out crabs. If crabs establish in the shallow waters their presence would greatly alter community dynamics/ecology as any alien or non-native does in any community (eg. kudzu in the Southeast). And among the first organisms to be impacted by crabs and their mode of feeding would be critters like snails and clams. The shells of Antarctica organisms, like snails, are by nature not as heavy or strong as in other environments due to the lack of crushing predators. There are no fish that can break open clam shells or otters to munch on urchins. But someday there may be clawed crabs in the shallows, and only the strongly shelled organisms or those that quickly adapt by making tougher-to-crack shells, will survive. 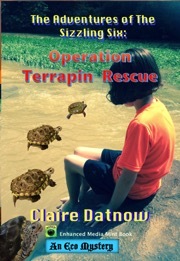 Claire: What significant new information has this project yielded? Each of the four broadly Antarctic marine avenues of exploration outlined above have contributed to the basic biological understanding of the Antarctic marine ecosystem. Specifically, it is now basically understood how krill survive through the long dark winters of Antarctica and maintain such high productivity/abundance. Advances in ship ice breaking ability allowed scientists (like lucky me) to sail to Antarctica during the winter and collect krill in ice-covered waters typical of wintertime. The chemical ecology project has contributed not only to advancing our understanding of basic marine community ecology but has also impacted human society. Several of the unique chemicals (also called natural products) isolated in our studies have use in the medical world. For example, a natural product produced by a tunicate (benthic sea squirt) is very effective against the growth of human melanoma cells. Better living through chemistry! The results of both the ocean acidification and deep sea crab studies add to the mounting urgency to take measures to halt or slow climate change lest alter life in all of Earth’s environments. Claire: How do you envision future projects? Though I am no longer directly involved in krill research, investigators in Tasmania have successfully reared large numbers of krill in the laboratory are studying the effects of ocean acidification on krill growth and reproduction. In February 2016 I return to Antarctic to study additional aspects of marine chemical ecology and for the next three years will focus on a particular red alga and its very unusual chemistry. Stand by for news on what those studies reveal. We are still analyzing some of the ocean acidification data and will need time to figure out what the next steps for that will be. Same too for the crab work, but I would love for use to be able to maintain crabs long term in the laboratory and learn what them tick. It would also be crazy cool to be able to monitor or track the movement of individuals living on the sea floor. This of course would be technologically tricky but that is what was once thought about sailing to Antarctica in the winter to study krill. Claire: What are the steps needed to launch the next phase of the project? Any scientific study requires inspiration, lots of perspiration and of course lots of funding. Claire: How can ordinary citizens become involved in the project? Claire: It has been a great honor to have you as a guest blogger. My esteemed friend the honor is mine! I thank you for such a unique avenue in which to share the wonders and joy of doing science in Antarctica.